I've been reading up on growing flowers for cutting and floral design. I've put these in order from my most to least favorite. 5 stars: This book really spoke to me! Harampolis and Rizzio compare floral design with cooking. They start with a few basics--materials, "ingredients," cutting techniques--then move on to the recipes. So they start with a certain flower, then they show how to arrange it in 3 different ways: on its own, "with company," and for special occasions. They use flowers and plants readily available to me, and the recipes list numbers of stems of each one needed. Then they show step-by-step, with clear color photos, how to put the arrangement together, including how to prepare the container, etc. They use quite a few succulents, which I find intriguing and want to try. The containers look like things I could find at my local thrift store. After reading this book I want to try the recipes! The arrangements were usually fairly simple, with a limited number of stems used, but the finished products are stunning. They make it look like even I could get results like that. I want to work my way through the whole book! 3.5 stars: Good information, with a few take-aways. This one is split up into 3 different sections: Planning and Stocking the Garden, Flower Arranging, and Flowers and Foliage Through the Seasons. The first part has 3 different garden plans, for a whole cutting garden, a small cutting patch, and a mixed garden. I like reading garden plans, though I have yet to implement one that I found in a book. Mostly, I tend to have my own ideas about planning such things. Still--fun to see some different ways to do it. Probably what was most helpful to me in the "Flower Arranging" section was the chapter on conditioning the flowers. Treatment of various types of stems (sappy, woody, etc. ), as well as how best to keep those flowers looking fresh for the longest time after they've been cut. Finally, the index at the back with all the flowers was great. Mostly basic info, but also included "Best varieties for cutting" and tips on conditioning for some species. 3 stars: Meet some of the movers and shakers of the sustainable flower world. 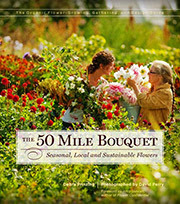 Highlights several of the people responsible for the resurgent of the local cut-flower movement. Most she talks about are on the West Coast, in Seattle or Portland areas. A few are from other places. She does have a good range of people from various parts of the flower business, including flower farmers, floral designers, and savvy consumers. I'm glad I found this one at the library, rather than buying it. I expected more about the flower business itself, and there was a little bit of that, but for the most part it was all about the people. Interesting, but not one that I see myself coming back to. 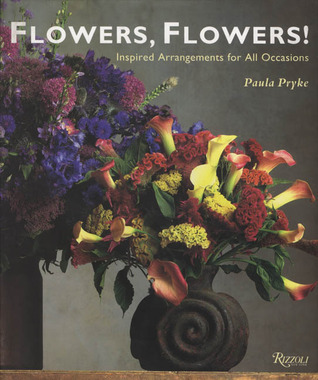 2.5 stars: Beautiful, full-color 2-page photos of various arrangements. A few new ideas, dense text. Pryke is a very talented floral designer. It was great to get a peek inside some of her design ideas. 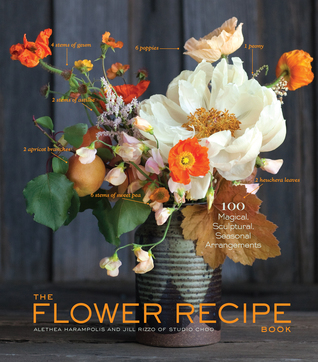 The chapters include: The Flower Market, Selecting a Theme, Containers, Colour Themes, Special Occasions, and Techniques. She has creative ideas for covering your container with plant material, or layering vases so that you can fill in the space between them as part of the display. I liked her ideas about experimenting within one color group. She even had a bouquet made from all edible elements that was beautiful and interesting. She has several pages with step-by-step instructions for various arrangements. Overall, it was useful. At the risk of sounding whiny, I have to say--the book was very big and the text very small. It put me to sleep a couple of times. I was disappointed by the "Techniques" section. After a book full of beautiful color photos, the Techniques section was all in black and white! Other than a few basics on tools, stem treatments, etc., it was primarily a guide to wiring flowers, or other materials. It was great to glean information and ideas from, but as far as recreating any of the arrangements, it was way out of my league. She has exotic flowers from around the world at her fingertips--large amounts of them, apparently--along with large, antique containers of various kinds. As someone who is interested in growing my own flowers for arrangements, I may never have access to some of her materials. 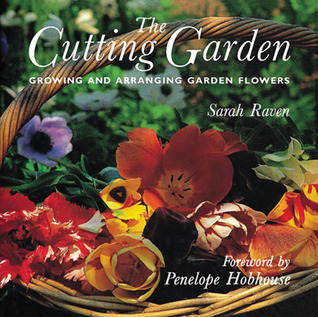 Have you read Floret Flowers Cut Flower Garden? I have that book and love it, and I’m trying to decide if I want the Sarah Raven Book or if it has a lot of the same kind of information. It’s not at my library so I don’t know!